The main objective of the trip was to send La Rambla. 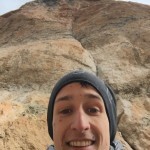 In January David started to train for the upcoming bouldering season. Together with his coach Urs Stöcker he put up a new training plan in Zurich. Since the trip to Catalonia was actually planned earlier he didn’t train his endurance specifically. Instead he’d done a lot of maximum and explosive strength exercises in the gyms around Zurich and spent 3 days bouldering in Fontainebleau where he did some milestones of the history in bouldering, such as „Karma“ (Fb 8A), „La Merveille“ (Fb 8A+) and „Partage“ (Fb 8A+). All of them are very technical and tricky. True Fontainebleau style which everyone knows who has been to this magical bouldering area once. Well, it was the first time that David has been to Catalonia in February. It is calmer than over New Year (not so many climbers). He stayed in a nice apartment of „La Vileta“ which is run by very friendly Catalonian locals, close to the main square of Cornudella de Montsant, the village underneath Siurana. Cornudella is pretty rural, mainly inhabited by farmers’ families who live from the surrounding olive, nut and wine fields. When you go climbing or walk around in the countryside you notice its beautiful landscape and nature. In the karst there are numerous caves. Dry and rocky areas dominate with a low vegetation of herbs, shrubs and pines. There are many rare species of wild animals. 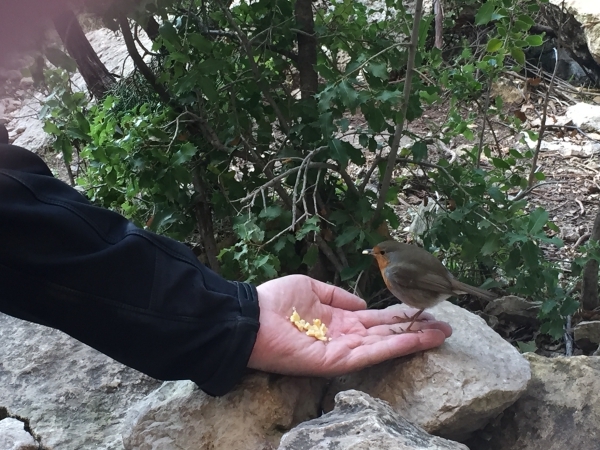 Because of their trustfulness robins often accompany you when climbing. 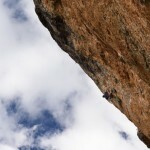 Because of its 9a+ difficulty La Rambla has been a new challenge for David. 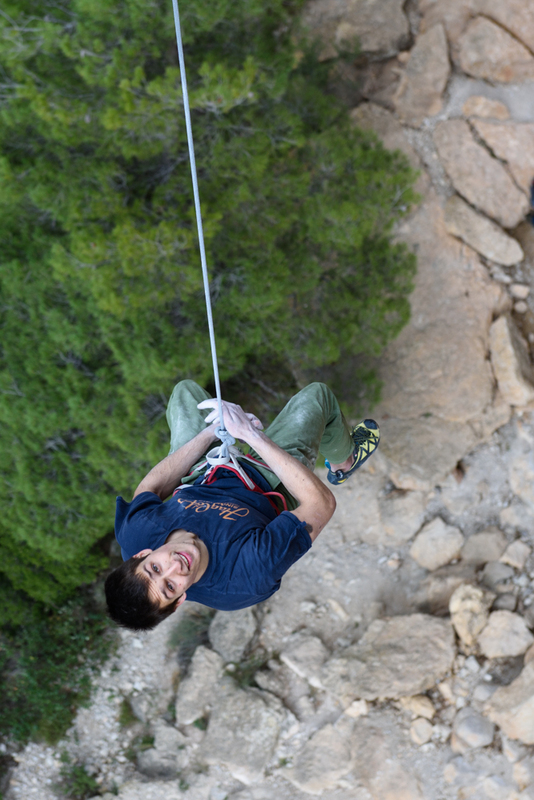 It is a long (around 45 meters), overhanging and technical route. It has got a famous name in the climbing scene. 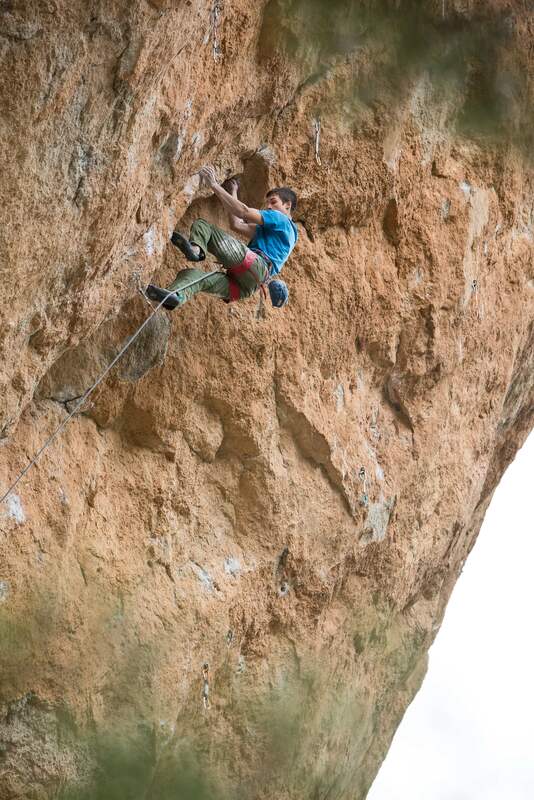 First ascended by Alex Huber to a lower anchor and extended by Ramón Julián Puigblanque to the actual top. It first kicks off with a technical crack followed by more powerful and pumpy moves with a unique jump in the middle to a rest before the hardest and most bouldery part at the end. Some years ago David did already „El Rastro“ and „Broadway“, two lines which share at least half of the route with La Rambla, so that he already knew the lower part. On the first day he once checked out the moves, brushed and tick-marked the holds and gave it a good try where he already fell in the last and hardest part at the top. There are 4 compression moves on round side holds and crimps which easily spit you off when too pumped after around 35 meters of climbing approximately 8c to this point. After this good first day of projecting David struggled some days with bad skin (especially the pockets literally ate the side skin of his fingers). Not the best conditions to send hard stuff. During these days he always fell on a certain and probably the hardest move in the route at the top from an open side hold into a small undercling which you have to catch close to your chest after you’ve reached out longly. In the past years such failures (falling on the same move without getting any higher) sometimes awakened negative thoughts and frustration in David. But meanwhile he can manage his mind set well. This time he didn’t really care about these failures and took it easy. To be honest, every time you fall and reflect what mistake you’ve done you somehow have a progress in your project. It does not always have to be that you’ve got some moves higher but that you have adapted your beta or optimized your clipping positions and rest points for example. It is actually a failure itself to think that there is no progression at all although you keep on falling on the same move. „It will happen sooner or later“ was David’s devise and he kept on trying with confidence and mental coolness. In the end it took him some 6 days of work to finally stuck the last hard move and top out his first 9a+ ever. 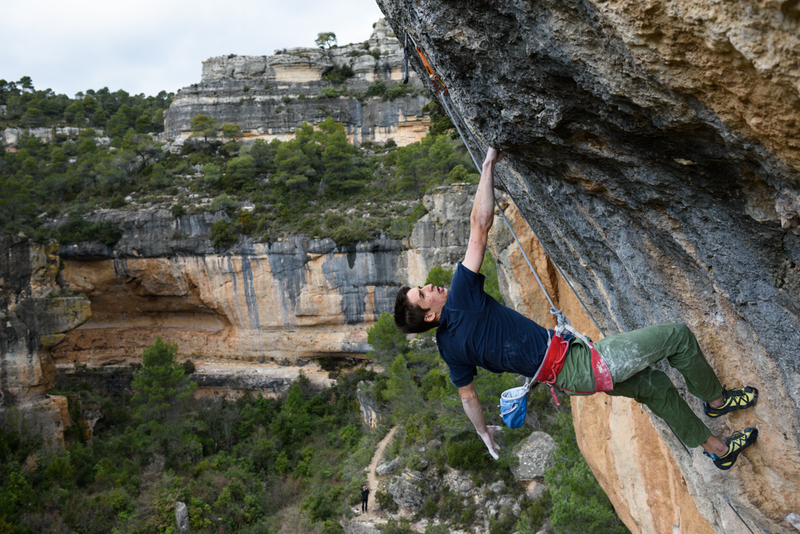 So, La Rambla represents a new dimension in his climbing and now it feels like that there are more years of personal progress in climbing still to come. There must be a reason why the years between 20 and 30 are called „The Golden Twenties“ in climbing The main task will probably be to keep the mental coolness alive and to work on the maximum strength, mainly in bouldering and in the gym. 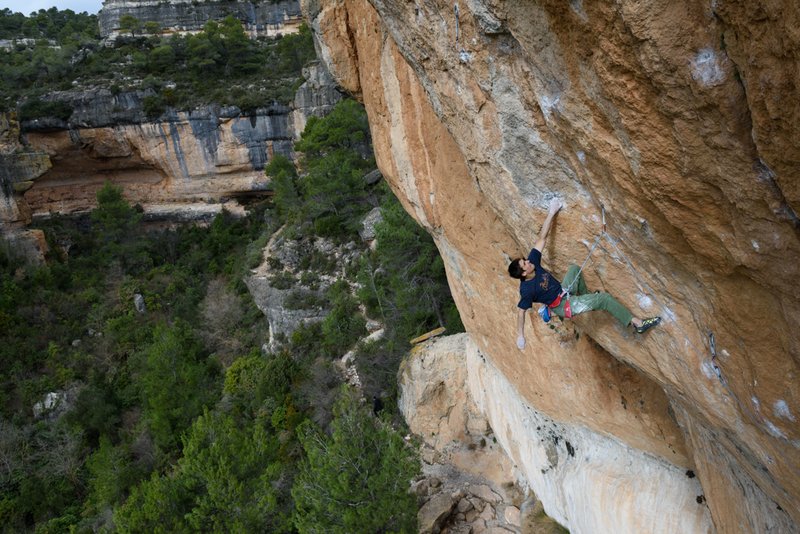 Right before David had to leave Siurana to head back home to Switzerland he wanted to use his fitness to dedicate to „La Reina Mora“ which has the same crack start and the same top-out with La Rambla but a more crimpy and sustained middle section. It is the real straight-up on this part of the wall. Falling two times on the last hard move in the end was a bit annoying but he had chosen a not optimal beta and when he optimized this it went down first go of the day and the finish of the trip couldn’t have been sweeter. La Reina Mora might be one of the most beautiful climbs in whole Catalonia. David is happy to return back to Switzerland again to prepare for the upcoming bouldering competitions and rock climbings in Switzerland. University lectures start as well again and it is great to come back home to reload batteries for the next challenges which climbing always has to offer in a brilliant way. Thanks to Iuliia Leonova and Jon Caldwell for their nice pictures and to our sponsors Scarpa, Haglöfs, Friction Labs, Escaladrome Hannover and the DAV section Rhineland-Cologne for the amazing support lately. As the Spanish climbers say: A Muerte!!! 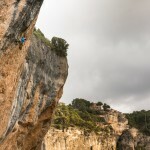 Dieser Eintrag wurde veröffentlicht in Allgemein und verschlagwortet mit 8A, 8c+, 8c+/9a, 9a, alex huber, bouldering, broadway, catalonia, catalunya, climbing, cornudella de montsant, dav, dav sektion rheinland köln, david firnenburg, el pati, el rastro, escaladrome, escaladrome hannover, espana, firnenburg, firnenburgbrothers, fontainebleau, france, friction labs, haglöfs, Iuliia Leonova, jon cardwell, karma, Klettern, La Merveille, la rambla, la rambla original, la reina mora, la vileta, lead, mountain, mountains, outdoor, Partage, petzl, ramon julian puigblanque, rock, ruben firnenburg, scarpa, sierra de prades, siurana, spain, switzerland, Training, urs stöcker, wettkampf, zurich von admin. Permanenter Link zum Eintrag.